An international team of astronomers has identified for the first time a thick stellar disc in the Andromeda galaxy, the nearest large spiral galaxy to our own Milky Way. The discovery of the thick disc, a major result from a five-year investigation, will help astronomers better understand the processes involved in the formation and evolution of large spiral galaxies like ours, according to the team, which includes UCLA research astronomer Michael Rich and colleagues from Europe and Australia. 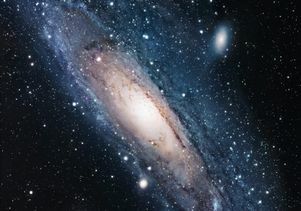 Using the Keck Telescope in Hawaii, the astronomers analyzed the velocities of individual bright stars within the Andromeda galaxy and were able to observe a group of stars tracing a thick disc — distinct from those comprising the galaxy's already-known thin disc — and assessed how these stars differ from thin-disc stars in height, width and chemistry. Approximately 70 percent of Andromeda's stars are contained in the galaxy's thin stellar disc. This disc structure contains the spiral arms traced by regions of active star formation, and it surrounds a central bulge of old stars at the core of the galaxy. "From observations of our own Milky Way and other nearby spirals, we know that these galaxies typically possess two stellar discs, both a 'thin' and a 'thick' disc," said Michelle Collins, a doctoral student at the University of Cambridge's Institute of Astronomy, who led the study. 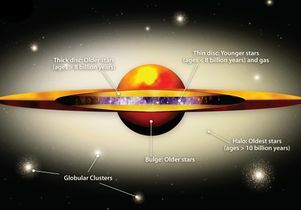 The thick disc consists of older stars whose orbits take them along a "thicker" path — one that extends both above and below the galaxy's thin disc. "The classical thin stellar discs that we typically see in Hubble imaging result from the accretion of gas towards the end of a galaxy's formation, whereas thick discs are produced in a much earlier phase of the galaxy's life, making them ideal tracers of the processes involved in galactic evolution," Collins said. The formation process of thick discs is not yet well understood. Previously, the best hope for understanding this structure was by studying the thick disc present in our own Milky Way. However, much of our galaxy's thick disc is obscured from view. The discovery of a similar thick disc in Andromeda presents a much clearer view of spiral structure. Astronomers will be able to determine the properties of the disc across the galaxy and will search for signatures of the events related to its formation, the researchers said. "Our initial study of this component already suggests that it is likely older than the thin disc, with a different chemical composition," said UCLA's Rich, who was the principal investigator at the Keck Observatory for the observations. "Future, more detailed observations should enable us to unravel the formation of the disc system in Andromeda, with the potential to apply this understanding to the formation of spiral galaxies throughout the universe." "This result is one of the most exciting to emerge from the larger parent survey of the motions and chemistry of stars in the outskirts of Andromeda,'' said Scott Chapman of the Institute of Astronomy at Cambridge. "Finding this thick disc has afforded us a unique and spectacular view of the formation of the Andromeda system and will undoubtedly assist in our understanding of this complex process." The study is currently available in the online version of Monthly Notices of the Royal Astronomical Society and will be published in a print edition of the journal later this year.